The Tokyo Metropolitan Police Department has set up a special department named Mishou (Unidentified Crimes Unit) for hard to crack cases without evidence, witnesses, or involving special organizations. These cases are beyond the scope of Keizoku (First Investigative Division’s Unsolved Crimes Unit). The section chief for Mishou is Kotaro Nonomura (Raita Ryu). He is a senior in age with a dignified look, so usually nobody blames him even though his answers are evasive. Working for Kotaro Nonomura are two problematic police officers with excellant police skills, who were transferred to Mishou for bad behavior. 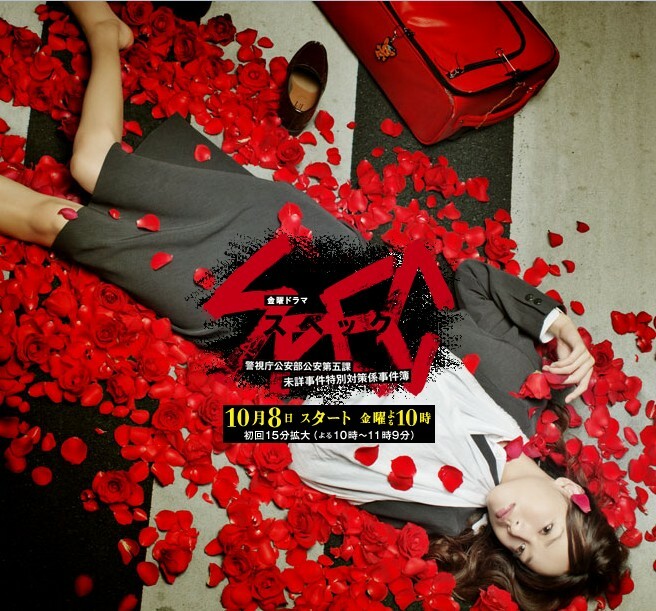 Saya Toma (Erika Toda) is a young woman with an IQ of 201. With her amazing intellect she became part of the faculty at the Department of Science at Kyoto University without schooling. Saya Toma also researched the X-Files at the FBI in the US. Because of her genius like intellect she often treats her superiors in a condenscending manner. Saya Toma is also a tough woman who is more than able to defend herself in physical confrontations. She has been with Mishou for one year. When she first joined Moishou she hurt her arm in a fight with criminals and has worn cast since. Takeru Sebumi (Ryo Kase) is an excellant career detective. He was picked for the Metropolitan Police Department's SIT unit and became platoon leader by the young age of 27. He is also highly skilled with guns and the martial arts. Because of an incident with a subordinate, Takeru Sebumi was pushed out to Mishou. Takeru Sebumi also doesn't trust Saya Toma. Saya Toma & Takeru Sebumi work on cases for Mishou first by postulating the "SPEC" of the unknown criminals. They then deduce the criminal's unknown "SPEC" and use this information to trap the criminals. "SPEC: Birth" is a sequel to the 1999 drama "Unsolved Cases" (Keizoku). Actress Erika Toda will wear virtually no make up for her role as Saya Toma. Actor Ryo Kase cut his hair shorter for the role of Takeru Sebumi. First scene shot for the drama took place in a hotel in Kisarazu, Chiba Prefecture. Takeru Sebumi, holding a mysterious paper bag, warns Saya Toma, who is dragging a suitcase, where the accident took pace. touda Oct 14 2016 6:29 pm "Actress Erika Toda will wear virtually no make up for her role as Saya Toma." Mick Jun 24 2015 3:07 am someone said it was toda's bad acting? i think she must be watch wrong actress,,, shame on you!! with her recognition at 67th Television Drama Academy Awards: Best Actress?? Hellowww... this is simply her best performance.. the sequel in movie tops the box office chart!! hae Dec 14 2011 6:00 am where can i watch the movie? argh i love this drama! christina Apr 19 2011 3:50 am don't listen to Ester. Erika Toda has portraited very good Toma. you have to watch this. it's a "must see". hebeaskim Mar 18 2011 7:42 am i love toda erika my fav actresss!!! !and yet i will watch this!!!!! Hans Mar 18 2011 3:26 am When will the next season air? hachi Mar 13 2011 10:38 am This is certainly a GOOD drama; it has an anime feel into it. There's a next season as announced in its official site. Ester Jan 27 2011 8:35 am I like toda erika but not in this drama, bad acting from her. Dom01374 Dec 20 2010 11:22 pm Nice gun work on the 2nd trailer, this drama seems interesting. kishi Nov 26 2010 10:40 am I love this site. All the wonderful comments from the fans, and great Drama info. Tsumiuta Oct 14 2010 4:45 pm The first Keizoku (series, 1999) was the best dorama I ever watched. I hope SPEC can live up to such standards. Lyza Sep 19 2010 7:09 pm I am so excited for this. I just love Erika Toda.